Denver is Toylab's home city and we will certainly have bloggers at Denver Comic Con taking pictures on our Instagram and reporting from Panels. Amongst the highlights will be Valiant which is planning for a major booth, event exclusives and panels at the event. It’s almost time for Denver Comic Con, and Valiant is prepared to bring its A-game to Colorado’s biggest pop culture convention this year with a brand-new slate of exclusives, merchandise, programming, and more! From Friday, June 15th to Sunday, June 17th, join Valiant within the Colorado Convention Center at Booth 1237 for a vast selection of our Volume 1 trade paperbacks, as well as other collected works, from the most critically acclaimed superhero universe in comics today – including award-winning and critically acclaimed titles like BLOODSHOT SALVATION, NINJA-K, FAITH, X-O MANOWAR, SECRET WEAPONS, BRITANNIA, ETERNITY, and more! Plus: If you’re looking to enter the comic industry, Valiant will be holding portfolio reviews every day of the convention, from 11 a.m – 12 p.m. and 1:30 – 2:30 p.m. at Booth 1237! Stop by to receive personalized one-on-one guidance from a member of our prestigious editorial team! Portfolio reviews are first come, first served, so don’t be late! While you’re at the Valiant Booth, check out the VALIANT HIGH #1 Denver Comic Con Exclusive Variant, featuring a limited-edition cover by Eisner-nominated artist Joe Eisma (Morning Glories, Archie)! 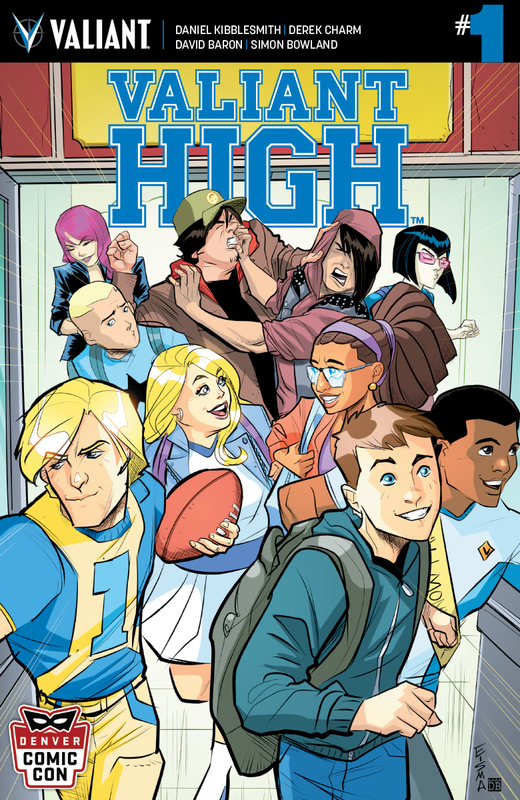 From rising star Daniel Kibblesmith (QUANTUM AND WOODY!, Lockjaw) and Eisner Award-winning artist Derek Charm (Jughead), get ready for your first day of school inside a hilarious reimagining of Valiant’s award-winning superhero universe – one where the next world-ending cataclysm will have to wait until after prom night! 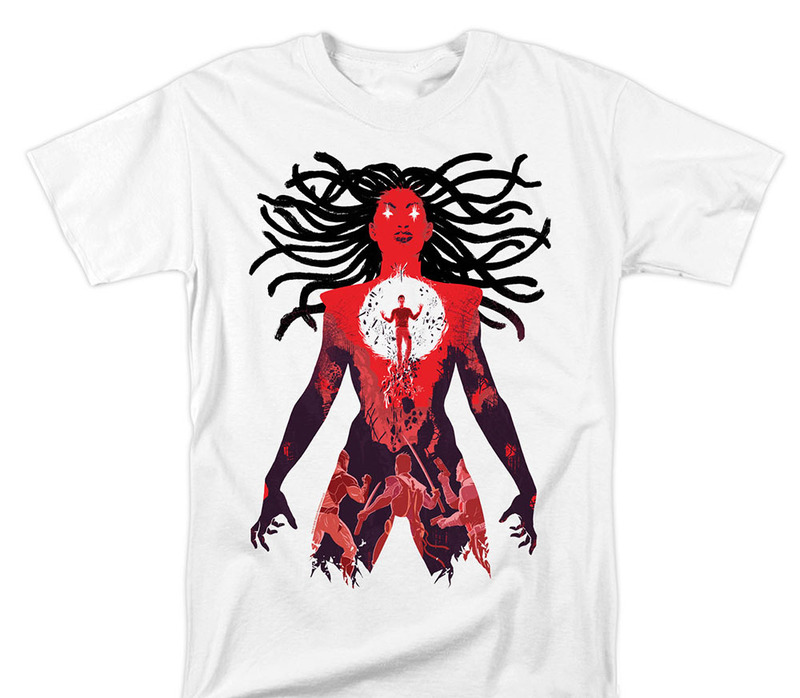 Also, gear up for HARBINGER WARS 2 with this Con-Exclusive Livewire T-Shirt, featuring art from the cover of the incredible HARBINGER WARS 2: PRELUDE #1, written by Eric Heisserer (Arrival) with art by Raúl Allén(SECRET WEAPONS) and Patricia Martín (BLOODSHOT REBORN)! Pushed to the brink by the government she once served, Toyo Harada’s former star pupil has made an irreversible decision… and deactivated America’s power supply in a last-ditch bid to save the extraordinary individuals called “psiots” from extinction. As a nation goes dark, the paths of our world’s most powerful heroes are converging… and the stage is now set for the most cataclysmic confrontation in the history of the Valiant Universe! Then, get ready for an unforgettable slate of panels from Valiant Entertainment all weekend long! First up: New to the Valiant Universe, or just looking to sharpen your knowledge of our vast array of characters? Valiant 101: New Fans Start Here! is the panel you can’t miss! On Friday, June 15th, at 3 p.m. in Room 501, join us for a concise and fun-filled introduction to the origins and adventures of Valiant’s greatest and most iconic heroes – from BLOODSHOT and SHADOWMAN to FAITH and HARBINGER RENEGADE to NINJAK and X-O MANOWAR! From The A.V. Club to Buzzfeed and Entertainment Weekly and dozens more, Valiant has been hailed as the premier superhero publisher in comics today. Now, look no further than this panel of Valiant all-stars to find out where to start! Next: Don’t miss the Valiant Presents: HARBINGER WARS 2 and Beyond panel presentation on Saturday, June 16th at 3 p.m. in Room 501! Valiant’s biggest, most ambitious and most impactful comic book event of all time is finally upon us – and in the aftermath of HARBINGER WARS 2, the Valiant Universe will never be the same! As X-O Manowar, the Harbinger Renegades, Bloodshot, Secret Weapons, and a cast of thousands draw their battle lines, find out what awaits this Fall and beyond as Valiant’s next major leap forward begins here! Featuring special surprises from acclaimed writer Jody Houser (FAITH) and dazzling artist Joe Eisma (QUANTUM AND WOODY!)! The excitement comes to a head on Sunday, June 17th at 3 p.m. in Room 501 for Valiant Presents: The Craft of Comics – a candid, behind-the-scenes panel discussion about the critically acclaimed comic series that make Valiant the best-reviewed publisher in the business! Find out just what it takes to put together a compelling story from start to finish, how to make your project stand apart, and how the editorial process functions at the highest levels – from the award-winning industry veterans behind the Valiant Universe’s greatest hits and a host of fan-favorite titles, including X-O MANOWAR, SHADOWMAN, HARBINGER WARS 2, and more! We’ll see you in the Mile-High City!